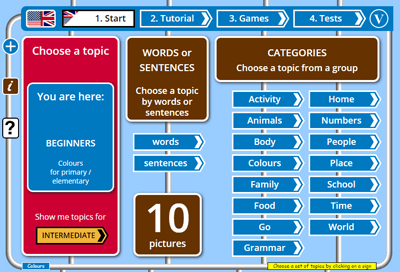 Choose a new English topic to learn! We currently have two types of English tests at English Activities, a comprehension test and a writing test. These simple and fun tests are suitable for children or adult beginners learning English as a second language (ESL). They will help you the learner to see whether you know, understand and can repeat the English for your selected English topics Our English tests should be used together with our English lessons and English games. Make sure you have chosen the correct topic before starting! Although these tests are timed, try to take your time and concentrate on getting the answers right at first - later you can try the tests again more quickly. On the settings screen, select the test you would like to take. A new screen will open with information concerning the test. When you are ready to begin, click "Start the test". 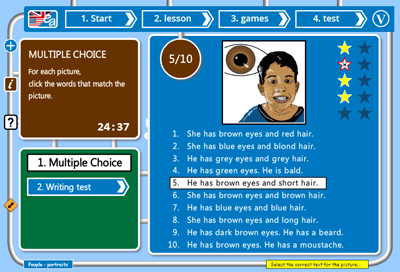 This is a multiple choice activity similar to "What is it" in the English lessons - you are shown a randomly selected picture from the topic you are using. All the topic words are displayed as a list numbered from one to ten. If you roll over any text, you will hear the audio for that vocabulary. For each picture, you must click on the word/s that match that picture. If your answer is correct you will hear a bell and one star will be lit. The next picture will be shown. If your answer is wrong, a box will open showing you what the correct answer was. The test is timed, and the clock starts when you click the Start button. The clock stops when you click your tenth answer. At the end of your test a screen will tell you how many of the questions you got right and how long you took to complete the test. The writing test checks whether you can type the topic vocabulary using your keyboard. This test is also timed. You can do the test many times until you get a good score. To start the test, click on the "Writing test" sign in the navigation board, then click on the "Start the test" arrow. A random picture from your selected topic is shown. Beneath the picture there is a white box into which you should type the words you have learnt for that picture. If you need a little help you can click on the "Help me" sign for a quick reminder of the vocabulary. Only use the help if you really need to. If you type the word or words correctly the computer will automatically light a star. If you have entered your answer and no star lights up, click on the tick or press Enter to check your answer. When you have tried all ten questions, a screen will show you how many questions you answered correctly and how long it took.